Bang up to the minute in the fashion stakes with all things to do with cake. 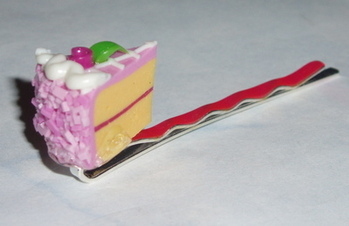 Fabulous dolls house miniature Piece of Raspberry Rose Cake Hair Clip. A beautifull fimo clay handmade piece of cake with intricate decorations, securely glued to a 50mm hair clip. Very fashionable and funky you will be sure to get noticed with this trendy hair clip.